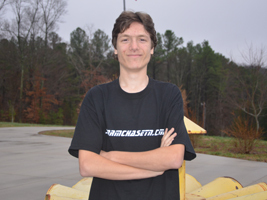 Matt has been interested in video production for many years and hopes to pursue it as a career. While his position in our team is video editor, we hope that his family moves soon to the Tennessee Valley in order to physically join our team in documenting storms via video and creating breath taking films for our site as well as our youtube channel. He has recently become more interested in the technical aspects of severe weather more than just looking at clouds and filming them. While he has never seen an actual tornado, it is safe to say he has seen his share of water spouts as he lives in South Florida. Matt has been interested in video production ever since he took a class in his early high school career. For a while, he has been interested in stage lighting effects but his interests have now shifted more to video. He was interested in media even before the class, but never considered it as a career. He also considered stage lighting to be his career. Needless to say, we are glad he is here with us to aid in our video production needs.